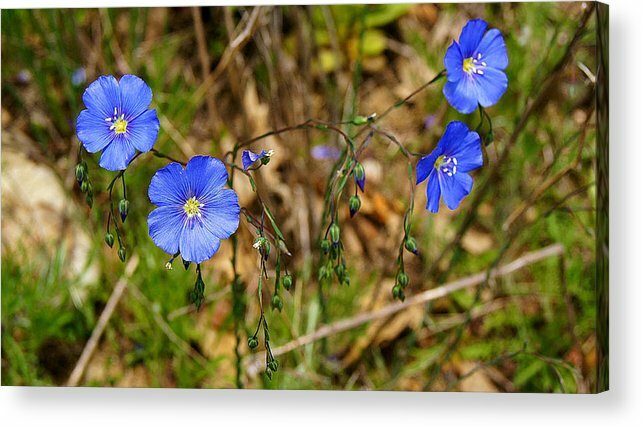 Flax Flower At The Chambers Island Lighthouse by Carol Toepke - 12.000" x 6.750"
Flax Flower At The Chambers Island Lighthouse acrylic print by Carol Toepke. Bring your artwork to life with the stylish lines and added depth of an acrylic print. Your image gets printed directly onto the back of a 1/4" thick sheet of clear acrylic. The high gloss of the acrylic sheet complements the rich colors of any image to produce stunning results. Two different mounting options are available, see below. There are no comments for Flax Flower At The Chambers Island Lighthouse . Click here to post the first comment. 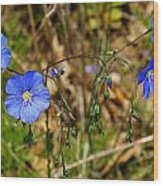 Common Flax is found in most of the western 2/3 of the United States. 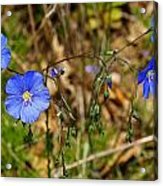 Linum Usitatissimum has five blue petals 1 1/4 inches wide, somewhat overlapping, red purple veins at base with five stamens with elongated white anthers, and 5 somewhat spherical stigmas. 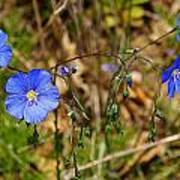 Also known as linseed, this plant is the source of linseed oil. The seeds and their sprouts are edible. The stalks have been used to produce linen since prehistoric times. Per Wikipedia: "Flax fiber is extracted from the bast or skin of the stem of the flax plant. 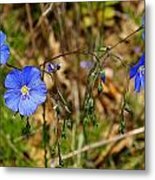 Flax fiber is soft, lustrous and flexible; bundles of fiber have the appearance of blonde hair, hence the description 'flaxen.'"